St Michael & All Angels is the parish church of Throwley. The first church on the site was probably built between 800 and 825. This would have been a small wooden structure, barely distinguishable from a farm building. After the Norman Conquest in 1066 this was replaced by a Romanesque stone structure. 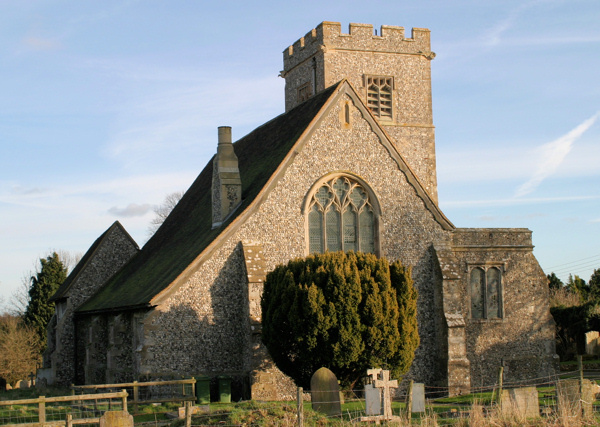 This was still small, but as the population of the parish increased the church was enlarged, until in about 1510 it reached its present size. Since then its appearance has changed little, although an extra storey was added to the tower - now far seen - in the 1860s. The church has an elaborate Romanesque west entrance; its east window in the chancel, by Curtis, Ward & Hughes of Soho, London, is a memorial to Throwley men who gave their lives in the First World War. In the Harris chapel is the church's newest stained-glass window, commemorating Dorothy Lady Harris who died in 1981. It was designed and executed in the Canterbury Cathedral Workshops by Frederick Cole (see pictures on left). The church has more than its fair share of fine 16th to 19th century monuments, mainly to members of the local Sondes and Harris families, and these are all described. Priest in Charge - Rev'd Canon Donald J Lawton CD, DipEd., BMin., MDiv.